Copal is a natural resin medium historically used by the Flemish masters to achieve their strikingly brilliant, enamel-like glazes. Utrecht Copal Medium is a modern improvement made from a blend of natural copal, synthetic resin, and refined turpentine. Light amber in color and fluid in consistency, it thins oil colors, enhances their transparency, imparts gloss, speeds initial tack, and also supports adhesion between layers. Unlike damar, copal is solvent-resistant when dry, so it's perfect for clean lifts when glazing. Whites and pale colors blended with Utrecht Copal Medium retain brightness and resist the staining that can occur from subsequent applications of color. Dark colors appear deeper, more vibrant, and retain a wet appearance after drying. 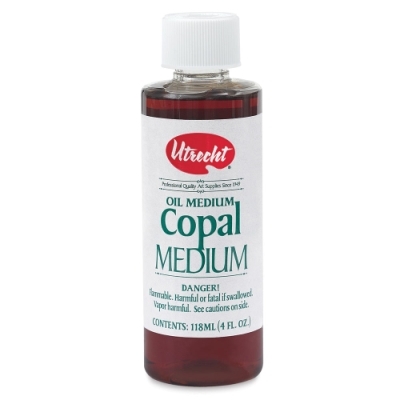 Utrecht Copal Medium is made in the USA.